Jewelry repair or restoration in San Diego! 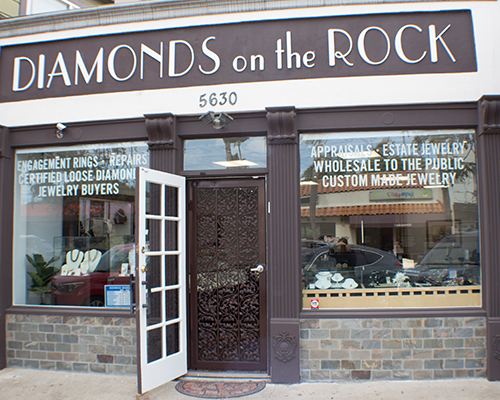 Diamonds On The Rock is your full service jewelry repair & restoration shop! Our family has been in the jewelry business for over 95 years! Expert jewelry repairs and alterations are done by master goldsmiths. Nothing is ever sent out! 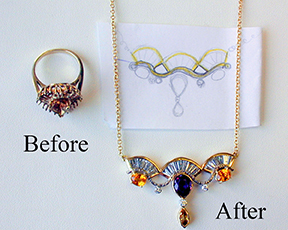 We re-design and re-finish jewelry also! Let us bring your family heirlooms to life again! From ring sizing and stone tightening to complete restoration of your antique treasures we can help! Come in today for a free estimate on your jewelry repairs and alterations. Regular service extends the lifetime of your jewelry and watches. This can prevent the lost diamonds or color stones. We can check the prongs that hold the diamonds and color stones at no charge. Come in to Diamonds On The Rock today to for all your jewelry maintenance! We will safely and professionally clean your treasures and check clasps for wear. CALL TODAY TO GET A FREE QUOTE ON YOUR JEWELRY REPAIR! WE CAN CONTACT YOU!